This short dialogue takes place between God and Jesus on the Judgment Day when he is asked if he gave his followers the belief of his own and his mother's divinity. He responds in the negative and begs complete ignorance on what happened after his death. This verse talks of two different and distinct phases of Jesus’ existence in relation to his people: one in which he was among them and the other when he was no longer among them. The boundary between these two phases is defined by the Arabic word "tawaffi". His absence from among his people is preceded by the state of tawaffi. The question is whether Jesus is present among his people or is he absent from his people? If he is not among his people then the state of tawaffi has surely preceded this state of absence. According to this verse, Jesus is keen to point out that the Christian belief in his divinity was not in existence as long as he was among his people, it only took root after Allah had caused tawaffi to him. The doctrine of Jesus' “Sonship” as a part of the Holy Trinity is a well established fact among Christians, so in light of the above verse it must be concluded that Jesus has already met his tawaffi. The only reasonable conclusion that may be drawn from this verse is that Jesus has already gone through the state of tawaffi, and if tawaffi means death then this verse is directly asserting that he has already died. This word has been used twenty four times in the Holy Quran, in all cases it means one of two things: death or sleep. Where the act is committed by God or the angels, and the object upon which this act is committed is a human, Tawaffi simply means death, except when it is used in conjunction with the qualifier 'night', in which case it means sleep. In all cases it applies to a person's soul and not to the body, and there is no exception to this in the entire compendium of Arabic literature, past or present. This hadith shows that the nature of tawaffi of Jesus is the same as the nature of tawaffi of the Holy Prophet. If that was not the case, Holy Prophet would not have said I will say what Jesus had said …. It is noteworthy that the Holy Prophet uses the same word and uses it in the exact same context. Furthermore, Imam Bukhari quotes Ibn-e-Abbas saying tawaffi means death. (Bukhari Kitab-ut-Tafseer under Maidah verse 118). Note this statement from Ibn-e-Abbas is in relation to this particular verse and is taken from one of the most trusted sources of Islam. The commonly understood meaning of the word tawaffi is death. The same word is used in funeral prayers (namaaz-e-janaza), where it is said: Cause us to die (tawaffi) in the state of submission. Assas-ul-Balagha, Qamoos, Taj-ul-Uroos, Lisaan-ul-Arab, Sihah-e-Johri, Farhang-e-Asaphia all agree that tawaffi means death. When God asks Jesus about certain Christian beliefs, he pleads ignorance and says that he has absolutely no idea what happened after his death. Remember this conversation takes place on the Day of Judgment. Now, would this be a truthful testimony if he had only a few years ago (40, as is claimed) made his second in-person appearance on earth, taken a good stock of the situation, done what he could to put matters straight and even waged a holy war against the Christians on account of their false beliefs? Surely in that circumstance his testimony would have been entirely different. He would have defended himself saying that while it is quite true that after being supernaturally raised to the heavens, and staying, supernaturally, alive for thousands of years without food or drink, and his poor followers on observing all this unique supernatural phenomena about him getting misled into concluding that he was a divine being, HOWEVER, once he landed on Earth he had strenuously refuted the claims of his divinity and worked on removing any confusion about his status as a normal, yet immensely talented, human being, and had forcefully made the Christians realize the error of their false beliefs. He says none of this, all he has to say is I just don't know! Conclusion: he never really returns. POint to be noted in each case you have translated "TAKEN UP" as "DIED" The fact is that Arabic is a bit complicated language to understand but easy to learn...the fact is here that one word in Arabic might contain several meaning. In order to get the actual meaning you will have to understand the context of the verse, which by the way is very important!! r u drunk or sumthin? The Isa of the Quran and Jesus in the New Testament are two different persons. Arab Christians do not use Isa for Jesus. The Maryam that is mentioned in the Quran is also different. The birth of Isa in the Quran and Jesus in the Gospel are also different. Please take note. Oh, and also Quran does not speak of Isa being crucified. *THE FIRST MAN(ADAM)DID SIN BY REJECTING GOD'S ORDER.SO SIN CAME INTO MAN BY FLESH AND BRINGS DEATH. *THE SECOND MAN(JESUS)BORN BY JEHOVAH'S OR ALLAH'S SPIRIT CAME AS A FLESH INTO THE WORLD DESTROYS THE SIN THROUGH HIS DEATH IN CROSS AND IN THIRD DAY HE AROSE OR RESSURECTED FRON DEATH AND LIVED IN EARTH FOR 40 DAYS AND WENT TO HEAVEN. *SO WE ALL DEAD BY 1 MAN AND WE ALL GO TO HEAVEN BY ONE MAN. *THOSE WHO REJECT JESUS(GOD'S SON OR GOD'S WORD)CANNOT GO TO HEVEN WHERE GOD LIVES. but christians do not worship jesus, they worship god. they do say things like "through jesus christ" which requests intercession, not unlike the shia. you should also check out the difference between worship and veneration. mary is venerated by some. The notion of Trinity appeared during the rule of pagan Roman emperror constantine. As far as I am concern God is supreme beyond our imagination. So,we should stop castigating and leave the end judgement to God alone thus try to be harmonious and tolerance while on this planet earth. The word there is not "die" but instead "Take me up" there are various comments and discussions on such an issue. No, your wrong. Jesus a.s. is still alive and will come back when Dajjal appears. Dont pass out the wrong message if you do not have the proper knowledge.you also dont have the ability to understand the verses of Quran.if you really want to know the fact then,you have to take help from ulema.otherwise if you only want to make fun then you are one of the biggest fool.Before you, many people tried to make this kind of rubbish message but their effort is in vain. @Anonymous: There are billions upon billions of people who have "neither been killed nor crucified". Using your logic, they must all be alive on the 2nd sky! It is clear verse about jesus that he was protected and ascended to heavens and it is our duty to recite Quran with Tafseer and with authentic translation. GOOD WORK,I REALLY APPRECIATE.ALSO WORK ON THE MUWADAT OF IMAM ALI A.S. If it was a neutral analysis, you might have earned some respect for conducting such a "detailed" research. These comments have ripped apart your "scholarly" qadiani approach of using quran as tool to serve your vicious purpose. How you translate The Quran your own self???? you have no idea about its just one word , how you translate the "Ayyat". Dun't make any mistake on which Allah give you big punish. I warn you.Accept your mistake ! its too wrong page , some one more say that ALI "A.S"
All we know that Hazrat Mohammad S.A.W is the 100% last prophet, now no prophet is come till Qiyamat"the judgment day", please correct your concept other wise you know about The super and big power the "ALLAH"
i urge you all to get hold of the fact that both religions teach to bring harmony amongst people. so, lets not quarrel over all of this, Lets "come to common terms between us and you", we both know that Jesus/ISA was sent from ALLAH/GOD. Lets quarrel with people who dont think he even existed!!! 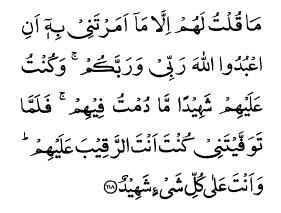 Let us (muslims & christians) ask ALLAH(in our prayers), before going to sleep at night, that ALLAH shows us the right path, path to acheive salvation, path through which we can recognize the Antichrist and fight against DAJJAL. May peace be on all of you. Lets not quarell amongst each other, i think our religion tell us to create harmony amongst people. let us "come to common terms between us and you". We both know that Jesus came to this earth, he was sent by God/ALLAH, and that he gave us Bible/Injeel. We should quarell with people who do not think he even existed!!! Remember, both of us have to fight Antichrist/DAJJAL, so why quarell amongst ourselves??? May ALLAH be with us all. Peace be upon all of us. JESUS BIRTH WITHOUT A FATHER TO MARRY WAS A MIRACLE, SO NO WONDER THAT HIS LIFTING UP BY ALLAH TO SKIES IS ALSO A MIRACLE.Think over it man. I pray you see the truth and come to right path and succeed in both worlds. Ameen. ONLY GOD CAN JUDGE AND ONLY HIM ALONE KNOW'S HIS TRUE WORSHIPPERS. I BELIEVE IN GOD (TRINITY)AND WILL KEEP SERVING HIM THROUGH CHRIST JESUS, AMEN. Everyone needs to read the whole article. I see proof everywhere, but no one is willing to look at it with an open mind, instead, they are defending their own views.